My dog family now. Safi, Pod, Rusty and Bree. My first dog family in the 1990's. Millie, Finn, Ollie, Storm and Ben. Bree and Safi on a practice Husbandry Project visit to our local vets. Christian has lived with, loved and trained dogs for some 30 years. She worked for Social Services with young people at risk of care or custody and is a qualified and experienced teacher. Working as Head of Department in a large secondary school she led the schools Specialism Subject, mentored student teachers and delivered training and professional development for staff and wider audiences on learning and other education topics, developing expertise in the areas of curriculum structure, teaching problem solving and critical thinking. 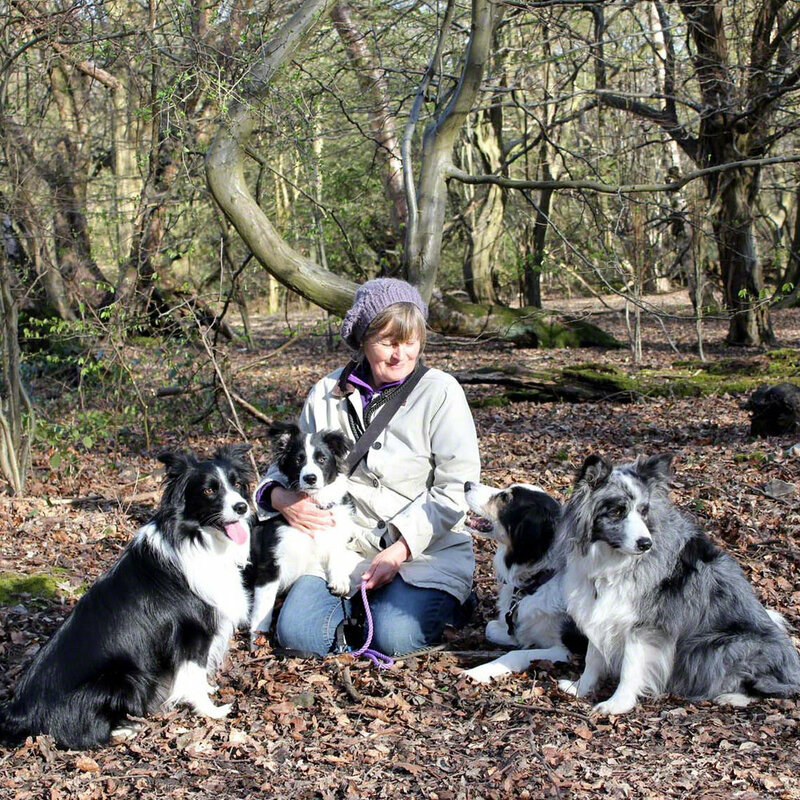 After leaving full-time teaching, she adopted her family of three Border Collies, Rusty, Bree and Safi who were later joined by Pod. As well as training and behaviour modification, Christian runs scent work training days for people with reactive, fearful or anxious dogs and is an experienced public speaker able to deliver talks and seminars for a variety of audiences. 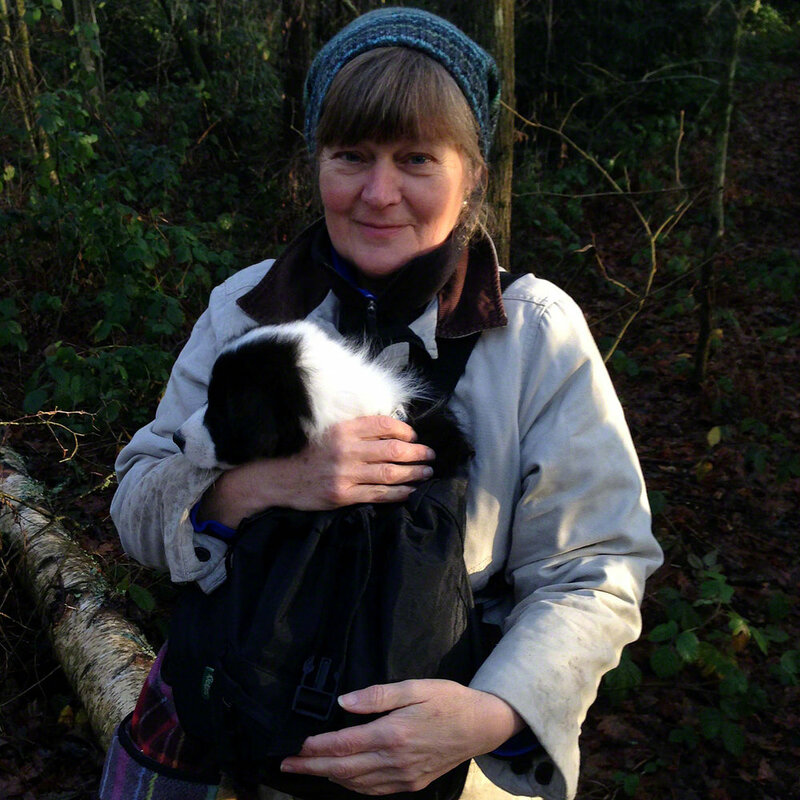 Christian is a professionally qualified teacher and is an Honours Graduate of The Academy for Dog Trainers where she gained her qualification as a Certified Trainer and Counsellor (CTC). Known as the Harvard of Dog training, this two year rigorous programme in behaviour, training, behaviour modification, teaching and counselling is widely considered to be unrivalled worldwide. Christian is currently taking part in an international pilot project testing training plans to help dogs be relaxed during veterinary procedures. Working in collaboration with Veterinarians and their staff, once finalised the plans will be available in owner friendly language. Christian is also a Certified Fear Free Animal Trainer. Fear Free was created by Veterinarian Dr. Marty Becker, a passionate advocate for the human animal bond and a leading US Veterinary practitioner and professor. The Fear Free Animal Trainer Certification Programme is designed to give already qualified force free trainers, the knowledge and tools to implement Fear Free techniques with their clients. This qualification also certifies Christian to work in partnership with Veterinary practices. Christian has completed a course in Human Behaviour Change for Animal Welfare and recently took part in a mentoring programme with Michael Shikashio focussed on aggressive behaviour in dogs. This was delivered through the IAABC Professional Continuing Education and Development Facility. Christian is currently studying with Professor Susan Friedman on the Applied Behaviour Analysis Course, “Living and Learning with Animals”. This is a multi-species course for those working with animals professionally, and is comprised of trainers, behaviour consultants, zoo keepers and veterinarians. For more information on the Husbandry Project visit here. Christian founded Together Dog Training and Behaviour Consultancy to bring best practice in training and behaviour to the lives of dogs and their people. She is dedicated to helping people and their dogs through positive reinforcement training and behaviour counselling based on the science of learning and the laws of behaviour. Back in the days before digital, I remember the astonishment when I first developed a black and white photographic print. As I wobbled the tray of developing solution back and forth, at first I only saw fuzzy greys, no definition, no clear shapes. As the print developed slowly a picture emerged, crisp shapes, identifiable objects, the picture resembled the image I had in mind. I still get that buzz every time I work with a dog and their people to shape a new behaviour or change a dog’s emotion from “scary thing” to “wow – great thing”. As we start training, the learning is fuzzy, just like the greys in the photograph. As the learning develops the behaviour becomes more precise, the dog becomes able to respond to signals that let them know that this is the behaviour we want and we will reward. Just as the photograph develops, so does behaviour. When a dog enjoys learning through positive reinforcement, we see it on the dogs face, how they wag, how they wiggle with their own sense of fun and delight. Watching the learning process in action, seeing the smile on the face of an owner of a troubled dog or someone who needs a recall for their dog to be safe outside in the world is my great joy. Helping the partnership between dogs and their people blossom is a privilege. We humans have been at this relationship a very long time, some 15,000 years – how do we know this? The science tells us. So is science good for dogs? – You bet! If you’ve ever been bored witless in a science lesson at school, dogs are where science gets up close and personal – right here in our living rooms. Science describes dogs’ behaviour, it tells us what motivates them, how they play, how they smell and how they learn. Science tells us about this amazing genetic package we call “Dog”. Whether you have a Chihuahua or a Great Dane or any shape or size in between lounging on your sofa right now, their niche on this planet is living with us, they are dependent on us, we are their guardians and advocates – dogs are very, very special.